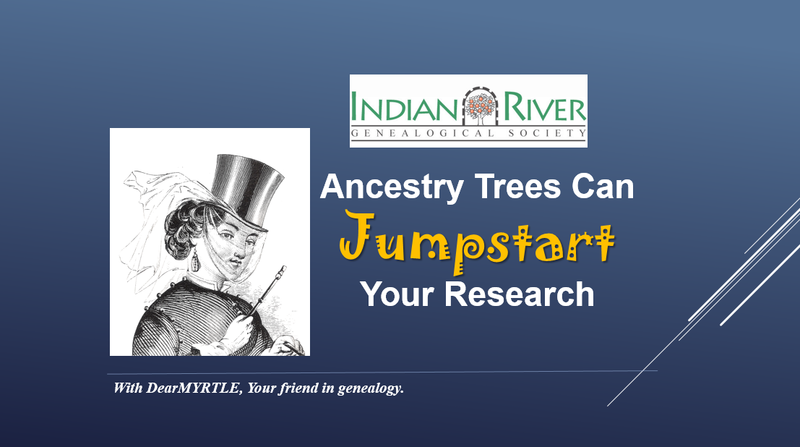 Our friend Bob Inoff has asked Ol' Myrt here to provide a virtual presentation for the November meeting of the Indian River Genealogical Society. The meeting location? The Indian River County Main Library, 1600 21st St, Vero Beach, FL 32960. Here's the info from their press release and information about attending virtually. The Indian River Genealogical Society is pleased to announce the program details for their regular monthly meeting to be held on November 10, 2015. The meeting is to be held in the first floor meeting room at the Indian River County Main Library, 1600 21st Street, Vero Beach. The business meeting convenes at 9:30 AM, followed by light refreshments. The featured lecture begins at 10:30 AM. This meeting is free and open to the public. Always at the forefront of what’s going on in the genealogy world, IRGS presents the newest method of bringing topnotch family history presentations to its members and our community. On November 10th we present a live webinar with DearMYRTLE. DearMYRTLE is the nom de plume of Pat Richley-Erickson, author of the award-winning DearMYRTLE Genealogy Blog, consistently among the top 5 family history blogs internationally, where the focus is beginning genealogy topics. DearMYRTLE hosts several weekly hangouts including Mondays with Myrt, Wacky Wednesday, and moderates study groups including Beginning Genealogy, Mastering Genealogical Proof, the Written Conclusion, and Genealogy and the Law. Find out more at www.DearMYRTLE.com . Ancestry Trees Can Jumpstart Your Family History Research—DearMYRTLE demonstrates the value and cautions using online trees, including the Ancestry.com sync option within Family Tree Maker 2014. Consider how deep the Ancestry.com search algorithm goes with the shaky leaf and the magnifying glass search options on a person’s profile page. Myrt has significantly revised this program, given the major changes with the new Ancestry.com. DearMYRTLE will appear virtually using a web-conferencing platform and one must be present to see and hear the presentation. Handouts will only be available on the day of the webinar at the meeting and due to contractual agreements, will not be archived on the IRGS website. This is a program not to be missed! !